– The freewheel version can be combined with duplex chainwheel. E.g. 48/38 teeth duplex chainwheel with a 22 teeth sprocket. All chainwheels with more than 32 teeth can be used. (Attention: The primary ratio of chainwheel teeth and sprocket teeth must be higher than 1,73)- The first choice for comfort bicycles is the turning shifter lever. If the market will require a trigger shifter (e.g. Shimano Rapid fire) we´ll react on this requirement. i-MOTION 9 Test im Velojournal gegen SRAM i-MOTION 9 (Comparison: Alfine vs i-MOTION 9 and finally i-MOTION 9 wins with 5:4 points! Which hub for which pourpose the SRAM definition SPORT / TREKKING / CITY! Cesur Bikes offers a LED light for the i-motion 9 turning shifter. The power for the LED is generated by the necessary hub dynamo. If bicycle lights with a “stand light function” (condensator) are used the shifter LED light also shines during stand the stand still of the wheels! Update 9/25/2010: Unfortunately it doesn’t appear that the i-motion shifter light is available anymore. The i-Motion 9 uses a twist grip shifter meaning that the shifter fits over your handlebar and is incorporated with the brake lever. Although some people prefer a trigger shifter (that unfortunately SRAM hasn’t developed for the i-Motion), one benefit of a twist shifter is that you can quickly shift through multiple gears in one quick twist of your hand, which isn’t possible with a trigger shifter. If you’re looking to purchase an i-Motion 9, click here to do so from Amazon.com. The i-Motion 9 shifter is also available at Amazon here . Hi, I have a new SRAM i-Motion 9. The ratios are very good and it is good to ride. My only query is fine tuning. Has anyone else had trouble with gear noise in 6 and 8? I have the gears tset precisely with the points nicely lined up but I get a bit of cog/teeth rattle in 6 and 8. Is this a running in issue or just some tweaking needed? I have set and re-set it and still get the noise on 6 and 8 only. Any tips greatly appreciated. I have a Swobo Dixon since April 2008 or so and have ridden in to work and back most days. 20 Miles or so per day on my 220lb frame. I already wore out one set of tires, so i probably have 4000-5000 miles on this hub. Adjustment and noise seems to be the achilles heel of this hub. Otherwise i have been very happy with it. Once you have aligned the hub by eye, you can tweak the hub from the shifter-end adjuster as you ride. you will notice that you can move the noise around between 6 & 8 or 7 & 9 while riding. My does not make a lot of noise, but you can adjust to minimize it. I also am getting the same noise in 6-8, i have taken my bike back to evans cycles on 2 occasions and they seem to think this is normal. Did you manage to fine tune yours as it’s driving me crazy. Any tips can you let me know? My experience is that this is normal – particularly with gear 6. I found that adjusting the axle tightness made a significant difference to the transmission of this noise – i.e. tight enough, but not too tight. It really doesn’t bother me now, particularly as it not associated with any appreciable difference in efficiency. Most riders today will not remember the days before the first 10 speed derailler bikes became the rage. Then the be all to end all in a bike was a Raleigh 3-speed also called an English Racer. We all knew that when shifting between gears on a 3-speed you had to pause your pedalling. When I got my first 10 speed, I had to learn to keep pedalling while shifting. Jump forward many decades and we have the 7,8, and 9 speed interenal hubs. Assuming that these hubs work the same way as the 3-speeds did, then you need to let up on your pedalling when you shift. Do this and you will virtually eliminate all shifting noise. At least it worked for me. has anyone information on service tools requirement for the i-Motion 9 hub? what about lubrication requirements – is there a ‘special’ SRAM lubricant, or can ‘off the shelf’ products be used. I am in the USA and considering buying an I-Motion 9 to use on a MTB frame for gravel road commuting and light single track MTB riding. Anyone out there have any long term experience using this hub in that way? Had an i-motion 9 for almost two years and had nothing but trouble from it. Would not recommend to anyone. Can’t wait for it to be ecomically sensible to replace. I have just returned from a month of daily riding in Florida. My I-Motion 9 hub is mounted in a 700C wheel attached to a road frame with mountain bars, used only for riding on paved surfaces. I have found the setup to be ideal for several reasons. 2. The evenly-spaced gear ratios and quick shifting make riding with other cyclists hassle-free. 3. The ability to shift down while stopped for traffic signals turns out to be far more useful than I anticipated. I have had no maintenance issues with the shifter or the hub. The noise of which some users complain seems minor when compared to the freewheel noise made by my Campagnolo Athena 8-speed hub. Noise is a relative term. One caveat: For road bike use, the gear range is limited. You can choose to use a large chain ring, which will make steep climbs and quick starts a problem, or you can choose a smaller chain ring, which will leave you spun out if you try to stay with a fast paceline. Your choice. Hi CJ, looking at the date of your initial post (i.e., for what it/s worth), I’d have to agree with John’s reply. For road-fun, I like a ~50’d tooth ring, but on firetrails & hills, the lower 40s are knee-easier. As a machinist in my previous life, I’ve become enthusiastically familiar with the i9’s idiosyncrasies, as well as, its relative ease of repair & maintenance. For someone that doesn’t want to open/upgrade their i-hub, or an off-the-shelf mostly-road/path commuter, the i9 is a no-brainer bang for the buck; besides, I wouldn’t take the chance of someone rolling off w/a Rohloff. In fact, maybe it’s divine intervention, but my less-expensive i3 has taken 6′ drops on a steel Redline better than its numbskulled 6’2″ & 200lb pilot (me). My preferred all-around is the i3, not my i9, because it’s simply-geared, lighter, quieter, cheaper (less appealing to five-fingered ownership & less tear-inducing when/if it fails). My i3 definitely hasn’t required the i9’s planning expertise or tuning after commuting shortcuts/obstacles (stairs, curbs, & potholes) and happily accommodates impulsive urges to mtb with full-suspensioned cohorts. Although we’re not talking S/As & I’ve lauded SRAMs, when someone states that a person needs a certain internal hub or that a particular unit is “junk”, I can’t help asking myself what would Sheldon do (WWSD)? Without a doubt the Rohloff is a mountain-friendly hub, but i-hubs appeal to a sense of simplicity. They are relatively cost-beneficial & parts are plentiful, while technological advancements have only eased maintenance and promoted reliable. Rohloffs & other ultra-expensive internal hubs seem more appealing to my sense of novelty than function. If cost wasn’t an issue, I’d try a Rohloff, but since I already know how simple the SRAMs are to repair & maintain, it’ be a hard sell. Help! I bought an i-9 second hand and don’t have the correct washers: I need the ones for track dropouts. I can’d find anywhere in the UK that has them, anyone have a spare set they’d be willing to sell/send me? 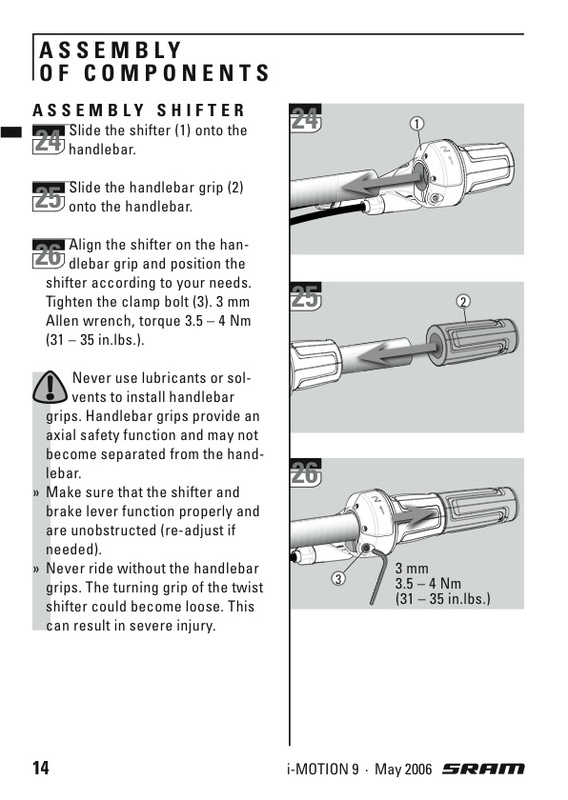 Dear CJ get a Rohloff the SRAM web site faq answer 19 says that the i-Motion 9 is not suitable for high stress MTB. It also seems to be saying at faq 16 that there is a different noise in gears 6-9. I would have to say on mine it is a dreadful noise that sounds like the gears are falling apart and no one has been able to tell me if it is normal. If it is normal it is not good. PS on the faq above http://www.hubstripping.com/sram-imotion9/FAQs_en.pdf that is 14 and 16 the SRAM site has since added a few. Availability of small parts and sprockets. Is the SRAM I-motion 9 shifter cable replaceable? The information regarding their “easy-click” connector suggests that the cable is specific to the shifter, but maybe I’m wrong. Does anyone know if the I-motion 9 uses a standard derailleur cable, like the Alfine? If a road bike has its chain-stay connected to a pivot-point behind the BB shell, and a short-travel elastomer suspension connecting seat-stay and seat-tube, will the resulting tiny change (during rear-wheel suspension travel) in the distance between BB-center and rear-hub-center cause any problems for the SRAM shift-cable? How much “forgiveness” is there in the shift cable? sorry to post only a commercial question. But anyone can suggest me an Internet shop in the old Europe where to buy the I-MOTION-disk brake? After many researches It seems impossible to find it here. I live in the old Italy. I like the i-motion 9 as well. internal gears are rare in Australia, but I have noticed them more and more. My question is also technical. The shop I bought the bike had problems fixing the gear changer. They had to rely on a knowledgeable customer to figure out how to reassemble it. There was nothing on line, or from the supplier, how to do this. Any links would be very helpful. I would love some help on how to install the cable for an i-Motion 9. I have a Giant TCR Advanced SL frame/fork set with cable guides as part of the frame assembly. The SRAM instructions are incredibly vague and implies zip-ties (?!) to secure the cable to the frame – such an inelegant solution for such a beautiful system. To resolve the cable guide concern, the solution I’ve come to is to use a Jagwire Cable Guide DCA008 near the fork along with a few stick-on DCA007s along the underside of the frame. Surly appears to make something similar. Anybody with a solution to this? Currently I am converting my Trek X500 from Deore to I-motion9. I also have some problems with guiding the cable through the frame, now I have cut my cable to short so I need a new one. Very stupid but now I got a better idea to guide the cable, nearly the same way as a derailleur system. Only housing till the cable goes through the frame, where it cames out the frame (bottombracket) I won’t use housing but the old plastic cable guider from my Deore system. Ps. I have stripped this hub completely and I will use it with engine-oil I think. Is it published anywhere, how the I-Motion is made inside – meaning, what planet gears are engaged at which speed? Are there speeds where more than one ring transmitting the power? What are the shifts, which involve more than one change in the transmission path? If you look along the bottom of the Web page you will see a link to “SRAM I-9 calc”, which shows how I reverse-engineered the gear tooth counts from the drive ratios. Is it possible to shorten the shifter cable on the i-motion 9? How is it done? …that link should get you to the pdf instructions about unscrewing the rear cable housing and exposing a spring and brass fitting with a 2.0mm allen screw (my screw appears to be seized up and I hesitate to drill and tap unless I can find another fitting). Currently, I’m examining shortening my cable from the shifter end via the molded plug in the housing. Sorry this is long-winded but your question hit home with me and I hope it helps you. I’ve installed this Shram i-9 on my long wheel base recumbent bike, had to install longer cable, (used regular long shifter cable for tandem) and it was easy as ever. Just remove the brass end assembly from old cable, cut new cable to size, then fasten with set screw. Worked excellent and easier than you think. My bike is 7 feet long and works great, needed adjustment with regular thumb screw after a week of use but works great. For the person that asked about assembling shifter part on handlebar: Simply assemble all small parts in the metal “body” side of shifter, not the plastic thumb side. Then push (snap) the two parts together. Voila, wokes perfectly but took me a few trys to align the metal disc inside was only hard part. I love this gearing system, have a little clunking noise when shifting between 6 or 7 but it’s minor and gets better with use and quicker twisting of shifter. Re: your posting on your SRAM I-Motion 9 shifter installation. I built a wheel around the I-9 hub and installed it on a drop bar single speed bike. The shifter is mounted on a stub of tubing which is attached, in turn, to a mounting bracket for “spinacci” bars. Somewhat cumbersome. I’d prefer to disassemble the shifter and mount it just to the right of the stem on the handlebars themselves. Your comments appear to suggest that this is feasible. Can you offer any specific suggestions? YES. You need a tool. The instructions come with the tool. Makes it so much easier! This gives the carefully-calculated, exact (fractional) ratios of most internally-geared hubs including the i-Motion 9. And, surprise — there appears to be an error in the SRAM documentation. The top ratio is 24/13, or 1.846, not 1.844, assuming that the top gear is consistent with the design of the rest of the hub (single-stage, compound planetary gearing, and the increase and decrease gears are inverse ratios). So the total range of this hub is 341%, not 340%. I am still gathering information on a few newer hubs — Rohloff, Shimano 7 and 8 speed, Sturmey-Archer 8-speed. I have good coverage of older Sturmey-Archer hubs but not of F&S hubs from before the 1970s. I would appreciate assistance with this. John, thanks a lot for this article! 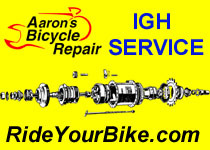 I just replaced the guts of an i-9 for a Bike Friday customer. SRAM warrantied it. 3 months old. The pawl loop spring for one set of pawls distintegrated and fouled 1st, 2nd and 3rd gear. Free-spinning only in those gears. An older Rock Shox dust wiper spring fit and would have repaired the hub. this type of spring is common on many forks. SRAM installs a factory punched nut that gets damaged when removed. It is the left most nut in the picture. Any alternatives to the cheapo grip shift for this hub? Could it be wired to a Shimano STI brake/shift control appropriate to drop bars? I tried to get in touch with Sram Europe about this, as I am also disappointed with the grip shift and would prefer a trigger shifter. I guess they would consider offering an alternative if there are enough customers asking about it. Does anyone have experience of combining the im9 with a front dérailleur/ 2 chainrings setup? Was it worth the hassle and compromises? This is talked about as a possibility, but I have found no reports of how it is in practice. 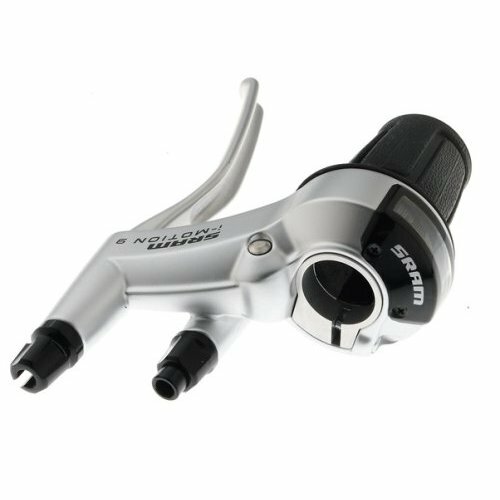 Can I remove the brake lever on my coaster brake i motion 9 hub and run the unit as a non coaster brake hub and use canti brakes? I have done that conversion on the i-Motion 3 hubs many times. 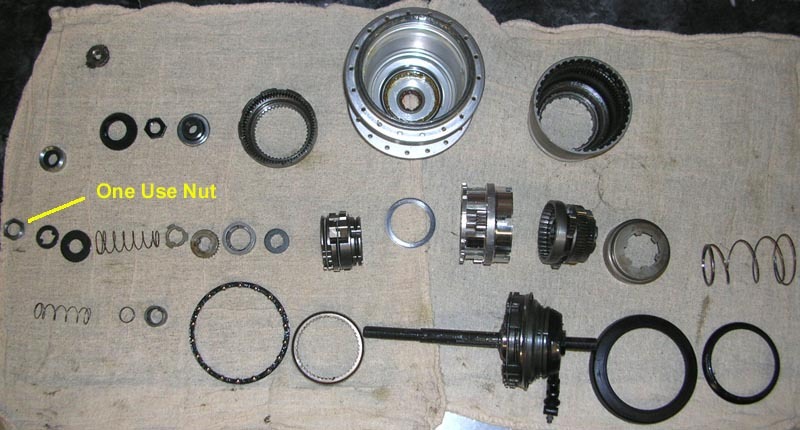 The 9 speed looks similar in the exploded view, but I have not seen one in person to test it. You SHOULD be able to remove the 6 rollers , the brake actuator (roller guide ring) and the brake shoes and the spacer and lockring. You can also remove the brake arm too. You will need a spacer to keep the dust cap held in place under the locknuts. I used a large lock-washer from the hardware store that fit around the spline interface of the brake arm cone. OR you could just cut off the brake arm! You could leave everything in place and just remove the rollers. Without them, the coaster brake will not work. I have the washers you need. Send me an email. This may be a newbie question — I just got a Civia Loring with an I-Motion 9 — but is there a way to ‘upgrade’ to a belt drive by changing the sprocket? It looks like in theory it would be a very easy change given the design of the sprocket, at least on the hub end… but I haven’t turned up any information in my initial search on whether this is possible. A belt upgrade was one of the very few things not my wishlist when I got the Civia! Is the i-Motion 9 still being made? I can’t find any in Europe, which is sad because on paper its the best coaster-brake & twist shifter hub. thank you for your suggestions and those tools immediately after a long time i examine that sort of write-up. thanks yet again. I now have an article about the i-Motion 9 hub at http://sheldonbrown.com/i-motion-9.html. This links to disassembly instructions which (with some care to keep small parts in order during disassembly) could be read in reverse to reassemble a hub. I’ve also linked to all of the technical information I could find online including a spare parts list, installation instructions and rebuilding the coaster brake. I have posted an article at http://sheldonbrown.com/i-motion-9.html with step-by-step disassembly instructions for the i-Motion 9 hub, also linking to all the technical information I could find online.